The endless plains of the Serengeti come alive as the horizon fills with the immense sight of two million wildebeests, as they move across the Serengeti on their way to Masai Mara to fresh grazing grasslands in what is the greatest migrations of the animal kingdom and the world. Accompanied by impalas, gazelles, elands and zebras these wildebeests make the marathon 2000 km plus circular run over the year on a course determined by the availability of grazing. A natural phenomenon that occurs every year. This migration has earned the Serengeti a place in the list of Africa’s natural wonders. The wildebeest arrive on the short grass plains of the Serengeti, south and southeast of the Seronera, in late November or early December and stay there though the months of January, February and March. It is here that most wildebeests birth their calves and prepare them for the next leg of their arduous journey. As the rains end in May some wildebeests move towards the north into Seronera, while most continue north west towards the Grumeti river where they stay till end June. The crossings of the Grumeti and Mara river happen through July and are a great attraction for visitors. 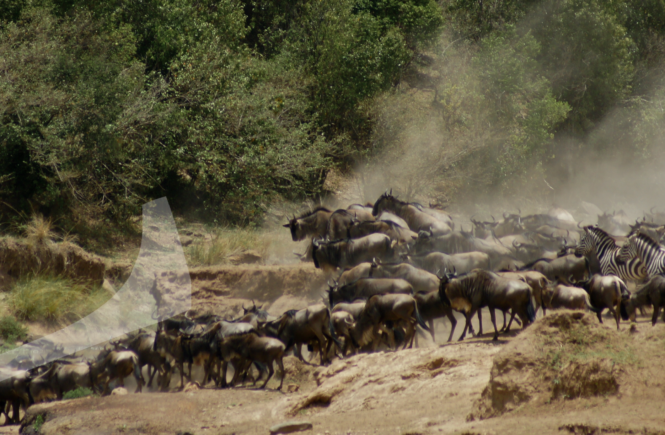 The wildebeests gather in large herds to tackle the strong river currents and continue on their journey. This crossing is fraught with danger for the wildebeest and not just from the swift flowing waters, but also from the local denizens – as crocodiles wait to feast and line their stomachs with wildebeests that stray from the herd. The migration then moves through the northern Serengeti towards the Mara river where they face their biggest obstacle, the hurtling waters of the river itself. This leg of the journey often exhibits scenes of great panic as wildebeests come loose from the herd and get pulled in by the river’s strong current. Have you ever witnessed a group of pedestrians crossing a busy road? The pedestrians wait till they reach critical mass enough to stem the flow of the traffic and then move across in a herd. The wildebeest crossing is very similar with the added risk of crocodiles waiting to feast on weak, unwary or careless animals. They arrive in Kenya in late July-August and stay there through the dry season till end October- early November when the herd starts moving south again to stay awhile before repeating this brutal cycle. They go through it again without hesitation following pure animal instinct to guide them towards greener pastures and their will to live driving them through the many obstacles that lie before them.